Every high school requires a course in chemistry, and many universities require the course for majors in medicine, engineering, biology, and various other sciences. 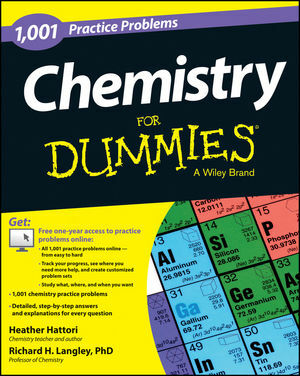 1001 Chemistry Practice Problems For Dummies provides students of this popular course the chance to practice what they learn in class, deepening their understanding of the material, and allowing for supplemental explanation of difficult topics. Whether you're studying chemistry at the high school, college, or graduate level, the practice problems in 1001 Chemistry Practice Problems For Dummies range in areas of difficulty and style, providing you with the practice help you need to score high at exam time. Heather Hattori taught chemistry at secondary and post-secondary institutions for twenty years. Richard H. Langley, PhD, teaches chemistry at Stephen F. Austin State University. He is coauthor of Organic Chemistry II For Dummies and Biochemistry For Dummies.